Can You Name This Famous Sculptor? Check back tomorrow for more information! Statues at Easter Island Mystery Maybe Solved? They may have walked there! For years people and even scientists have tried to solve have the Giant Easter Island of the Moai Sculptures arrived at their destination. These statues had to be move 11 miles away from a quarry where they where carved, and did not use wheels, cranes or large animals. Scientist has had May ideas and they had thought the islanders use ropes, log roller and wooden sledges. Recently two archaeologist came up with a new theory that the Moai where made to move upright using only rope to make the statues walk or should I say walk? As seen in the video. University of Hawaii and California State University Long Beach have worked closely with these archaeologist Sergio Rapu, who’s part of the South Pacific island’s population of indigenous Rapanui, to develop their idea. D-shaped bases could have allowed workers to roll and rock the moai side to side and walk it 11 Miles. Pretty cool and love the video of the theory in action. So do you think the Easter Island statues walked? Or do you have your own theory? Check out our replicas of these Easter Island Sculptures at www.Statue.com or click on the photo. Seems like the Classical Statue fall away in the younger generation but if they have traveled to Europe they find a new found love of Art History. Working in the statuary business it always interest me in finding out something new in a Classical Historical sculpture such as this Faun playing Scabellum in the Uffizi Gallery in Florence Graeco-Roman statue. 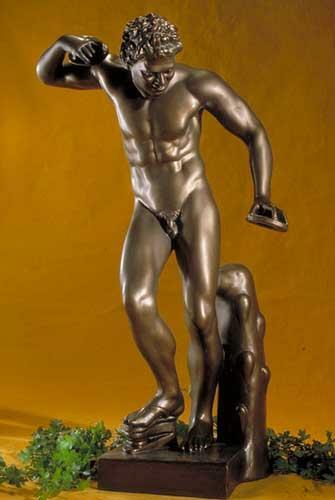 This striking version of the dancing satyrs, Pan, of Greek mythology has a completely human form. The Roman version of the dancing satyrs is called the dancing faun. In Greek mythology the dancing satyrs is known for his dancing, singing, laughter and chasing nymphs through the woods. Greek Mythology Satyrs the Dancing Satyrs was called Pan or Hylaeos, the forest god and guardian of the shepherds who worshipped Dionysus, the god of wine. Statues of the dancing satyrs range from a human form with the head and legs of a goat to a normal human form. The dancing satyrs, Pan, were the son of Hermes and Penelope, and born inArcady. The Dancing Satyrs was at home in the woods and enjoyed chasing the woodland nymphs. Pan would play the pipes and the nymphs would spend hours dancing and singing. Satyrs are always present at a Dionysus banquet or party, Dionysus was the Greek god of wine and ecstasy. The story of how Pan invented the pan pipes, which is similar to the pan flute, is an interesting mythological story. Pan was a joyful Satyr who loved dancing and playing on the shepherd’s pipe in the woods. One day Pan saw the nymph Syrinx and started after her. She ran until she came to a river. Syrinx turned into one of the reeds that lined the bank of the river. Pan could not recognize her so he grabbed a hand full of reeds hoping he could capture Syrinx, but he was unable to locate her. So Pan sat down beside the river and started tying the reeds together and soon he found that blowing over the ends made a beautiful sound, and it became known as the Pipes of Pan or a Seven Reed Shepherds Pipe. Faun is shown here playing the Scabellum which is a musical clapper that is operated by foot as depicted in the Greek and Roman Antiquities here with this Faun Sculpture. For years I have been selling this sculpture and knew what was under his foot! Now I know it is a musical Instrument. Not sure how it worked but it awesome to see I can find out something new from a Classic Sculpture I been selling for years. We at Statue.com have been provide Classical Sculptures since 1996 on the internet and it fun to find out new info on our statuary and Blog it! One of the most famous early images of a human is the “Venus of Willendorf” found in 1908 by archaeologist Josef Szombathy in an Aurignacian loess deposit in a terrace above the Danube River near the town of Willendorf Austria. The statuette is carved from oolitic limestone not local to the area found and tinted with red ochre. It is presumed to be carved elsewhere using flint tools. Originally thought to date from approximately 15,000 to 10,000 BC, a revised analysis done in 1990 estimates the carving to date from 24,000 to 22,000 BC. It stands at just over 4 1/2 inches and seem to be meant to hold in one’s hand since she is lacking feet to stand upright. Taking the name “Venus” causes resistance in some modern analyses. Many similar female statuette and images are collectively referred to as “Venus” figures although they pre-date the mythological figure of the goddess Venus by millennia. This idealization of the female figure has traits of fatness and fertility that may have been highly desirable in the harsh ice-age environment in which the person who made this statue lived. It has been suggested that she was carved as a fertility idol due to the exaggerated breasts and genital areas. She may also have been an early portrayal of “Mother Earth” and prominent female deity. Unlike today, women in the Paleolithic society must have played a more dominant role. The figurines and images of women are outnumber those of men supporting this theory. Do you have any thoughts regarding this wonderful sculptural representation of our early cultural heritage? Please send us your comments. We would love to hear from you! My oldest daughter is blessed to be in Europe right now on an 11 day college Fine Arts trip. The first email I received from her said: “Please send more money!” as reality of the value of the US dollar versus the Euro ascended upon her. Of course this request made me smile to myself; so classic was it. Her email today tells me they have left Paris and are now in Florence. “Saw the David again today. Always a brilliant experience,” she tells me and I hear already the sound of a seasoned world travel. Of course this makes me smile to myself. Yes. “The David“, kind of like Madonna, never needs a second name. 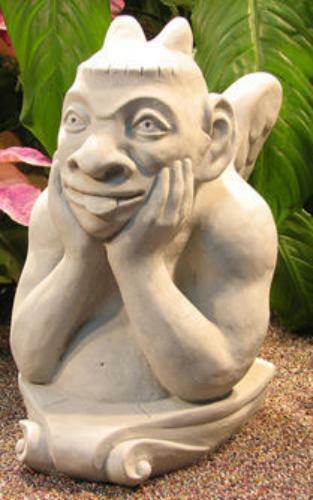 At Statue.com we sell this famous statue in various sizes, as a full figure, as a bust, and even just as parts, which make wonderful design elements for the artist, drawing class, or interior decorator. Call us at 618- 692-1121 if you need any help in choosing the perfect David for you!